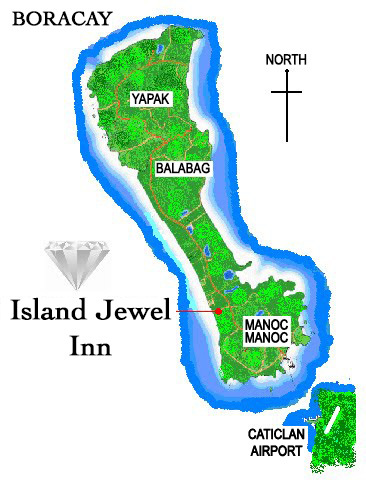 The island is served from Manila by both ferry (with cabins) or by air to Caticlan (recommended) or Kalibo. Our staff can assist you with reservations and offer an accompanied service between the hotel, Caticlan and Kalibo Airports. 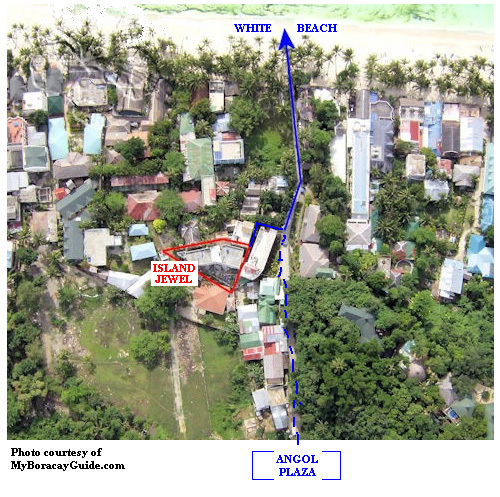 When you get to Boracay Island, please take a tricycle (you will see a queue of them) and ask the driver to take you to Angol Plaza. The fare is about 100php. Walk down towards the beach and you will see a small sign for the Island Jewel Inn (on your left) pointing down a pathway. Follow the pathway to the end and we are on the right hand side. Our telephone number +63 (036) 2884730 so please call us if you need our assistance. Perhaps you would be so kind as to inform us at what time you expect to arrive at the hotel so that we are prepared to greet you. To see the current weather conditions in the Boracay area (Aklan), see below. Boracay Island has crystal clear waters, sugary beaches that are cool when walked on, and lush green hilly landscapes. It is the iconic holiday destination that will lull visitors with its’ tranquillity, challenge those who are active (day or night) and amaze all with its’ beauty. It is known as a breathtaking, unbelievably magical island, an Island Jewel set in the unspoilt South China Seas.